Choose from a variety of lectern and podium styles to complement your stage. Lightweight acrylic lecterns offer easy set-up and storage, while wooden lecterns shine in elegance and durability. The Oklahoma Sound #112 is an attractive and durable AV cart ideal for supporting presentation equipment like projectors. The sturdy cabinetry Includes a shelf with ample storage space and four easy-roll casters (two locking.) This unit conveniently also serves as a base for the OS Model #22 tabletop lectern in order to create a beautiful mobile full floor lectern. Ships ready for easy assembly. The versatile Combo 22/112 Mobile Full Floor Lectern from Oklahoma Sound® features stain and scratch-resistant thermofused melamine laminate secured to a strong particleboard core. 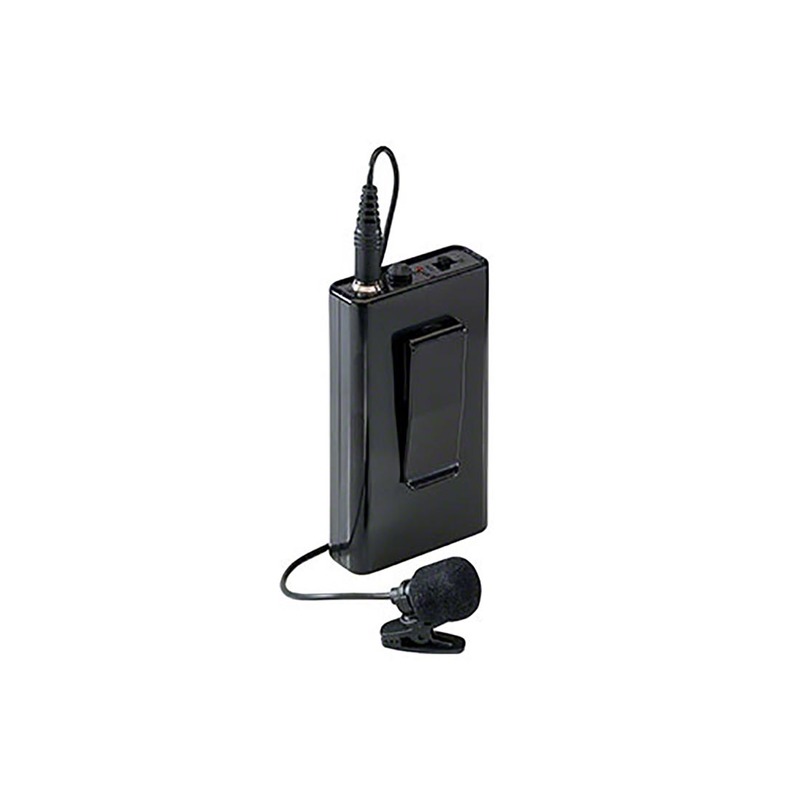 It is ideal for supporting presentation equipment like projectors. The sturdy cabinetry Includes a shelf with ample storage space and four easy-roll casters (two locking.) Available in modern two-tone Black with charcoal trim, Medium Oak and Mahogany. Assembly required. 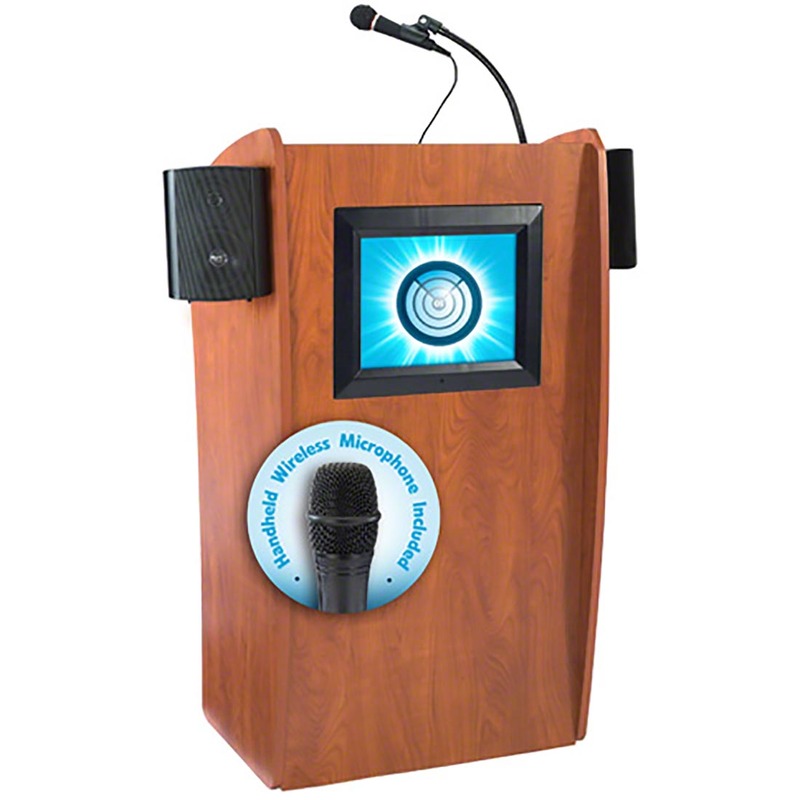 Practical and convenient speaker stand lectern has an application in every venue. Continuous adjustable height from 30”-44” to suit every speaker. Generous paper/book stop for your presentation materials. This contemporary designed lectern is made from 1/2" and 3/8" acrylic plexiglass. Very popular in the Evangelical Church, or in any modern business setting that calls for an attractive and unique podium. Features a convenient shelf. Arrives ready to assemble and is easy to set up in minutes. 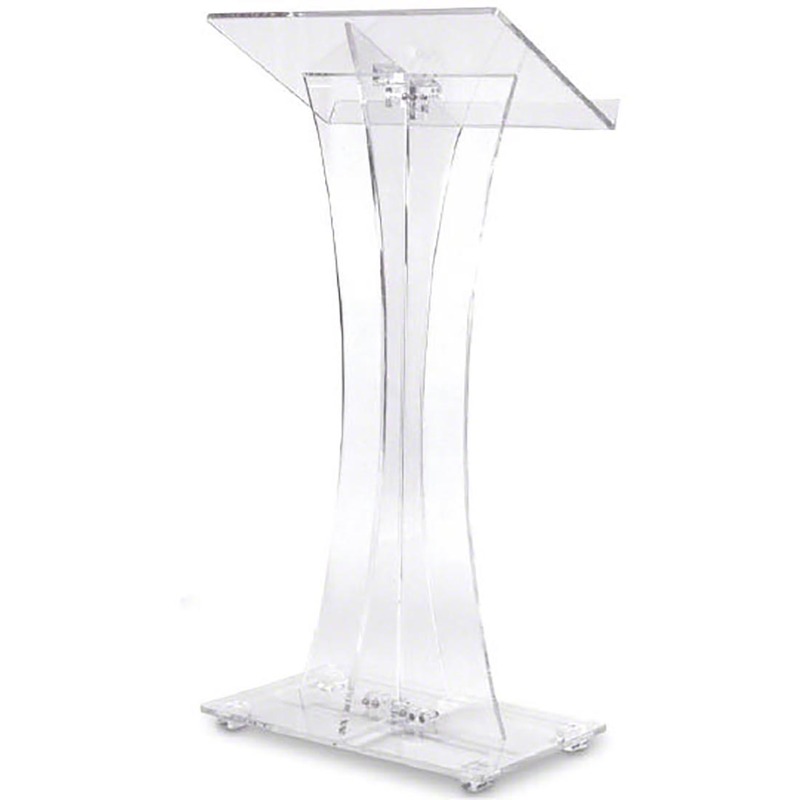 This contemporary designed curved lectern is made from 1/2" and 3/8" acrylic plexiglass. Very popular in the Evangelical Church, or in any modern business setting that calls for an attractive and unique podium. Arrives ready to assemble and is easy to set up in minutes. The Oklahoma Sound Model #810 Orator is an impressive and versatile, height-adjustable lectern. Its spacious reading surface adjusts from 42” to 52” high and is illuminated by a beautiful brass lamp. The Orator's solid and elegant cabinetry features ample storage space in a 12" x 4" shelf and four concealed easy-roll casters for smooth mobility. Minor assembly required. Oklahoma Sound's The Vision is truly a sight to see. This gorgeous, dynamic lectern perfect for presenting to more intimate venues like classrooms and conference rooms. Its sleek cabinetry features scratch-resistant, cherry-colored wood laminate over a medium-density fiberboard (MDF) core with two sizeable 14.5" x 23" shelves for ample storage and four concealed easy-roll casters (two locking) for smooth mobility. The Vision ships ready for easy assembly.